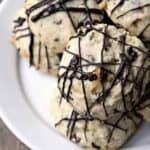 Holy Cannoli Cookies, an easy recipe for cannoli cookies with ricotta, chocolate chips, and pistachios! Fun Italian Christmas cookies, inspired by Italian cannolis, that will make a great additional to your Christmas cookie baskets and gifts this year! Ever have a cannoli? Growing up with an Italian American parent, we had cannolis regularly and they are one of my favorite desserts! Since we’re approaching Christmas cookie season, I thought it was about time to make some Holy Cannoli Cookies, inspired by one of my favorite Italian pastries! These Cannoli Cookies may not be an authentic Italian cookie recipe, but I love them as my own Italian Christmas cookies! Ohhh how I love making an assortment of cookies for the holidays, don’t you? My Elvis Inspired Cookie Cups and Chocolate Turtle Cookies are always a popular choice, but thought I’d try some new flavors and cookies this year and thus these fun Holy Cannoli Cookies were born! 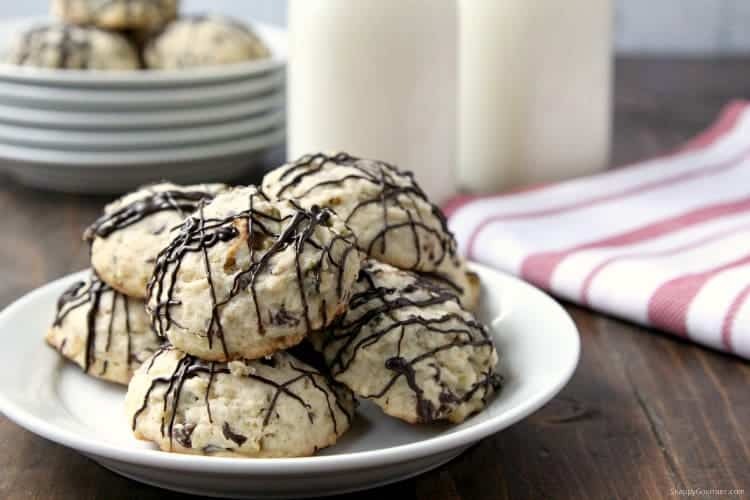 These Cannoli Cookies have a cake-like texture, and no they do not taste exactly like cannolis. Nothing tastes exactly like a cannoli besides a cannoli. But they are delicious and have a lot of great flavor! Cannolis are different to different people, so if you make substitutions or changes, you may have different results. Wondering what the heck a cannoli is? Maybe we should start with that. Cannolis are from the Sicily region of Italy but have become very Americanized. I asked a lot of my Italian American friends what kinds of cannolis they grew up with. Like pizza, everyone had their own favorites! Cannolis are made up of a fried pastry dough tube and generally filled with sweetened ricotta cheese. Cannolis may be plain with the sweetened ricotta and no additional ingredients. Or the cannoli filling may contain such things as chocolate chips, candied fruit, citrus zest/juice, wine, pistachios (or other nuts), maraschino cherries, and/or cinnamon. You can usually find cannolis at most Italian bakeries, specialty grocery stores, and even sometimes your neighborhood grocery store. You can even find a cannoli kit on Amazon and sometimes at local specialty grocery stores. Even our Costco carries a great cannoli kit around the holidays. Or if you’re wondering where to buy cannoli shells so you can fill them yourself, try these different types on Amazon or your local specialty grocery stores. You can even ask the Italian bakeries to sell you just the cannoli shells so you can make your own filling of choice. There are many MANY varieties of Cannoli Cookies. I’m not sure I’d say any are really authentic Italian cookies (so don’t send me hate mail….) but rather a fun twist on the Italian pastry. To start, cream the butter and sugar with an electric mixer. Then mix in the eggs. Next mix in the ricotta cheese. You can use regular or low fat ricotta cheese, although I would not use a no fat substitute, nor would I substitute cream cheese or cottage cheese. Then mix in the vanilla extract, cinnamon, and orange zest to the cannoli cookie batter. The cinnamon and orange zest aren’t really strong in this recipe, but they do give a nice subtle flavor. When all of that is well mixed, mix in the baking soda, baking powder, and salt followed by the flour. Stir in the mini chocolate chips and chopped pistachios. If you want you could substitute your favorite chopped nuts and/or chips. Cover and chill the dough about one hour or until it firms up just a little more. Then using a cookie scoop or spoons, spoon the cookie dough onto lightly greased baking sheets or baking sheets lined with parchment paper. Bake the cookies for about 8-11 minutes or until golden brown around the edges. Cool for a few minutes then move to a wire rack to finish cooling. When the cookies are completely cool, melt the rest of the chocolate chips and drizzle over the cookies. Allow them to sit a little while until the chocolate sets. 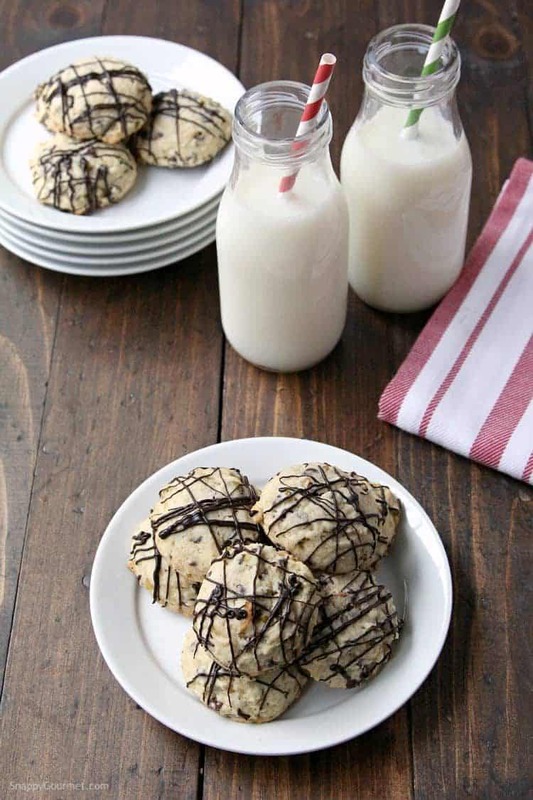 Then it’s time to enjoy these cookies with a big cup of coffee or how about Italian Hot Chocolate! Yum! Are you ready to make some cookies this year? Happy baking! 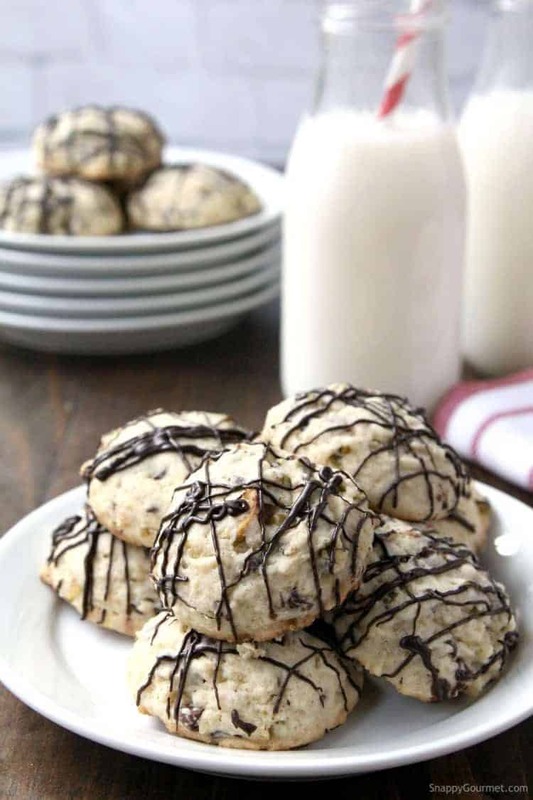 Hope you like these easy Holy Cannoli Cookies! 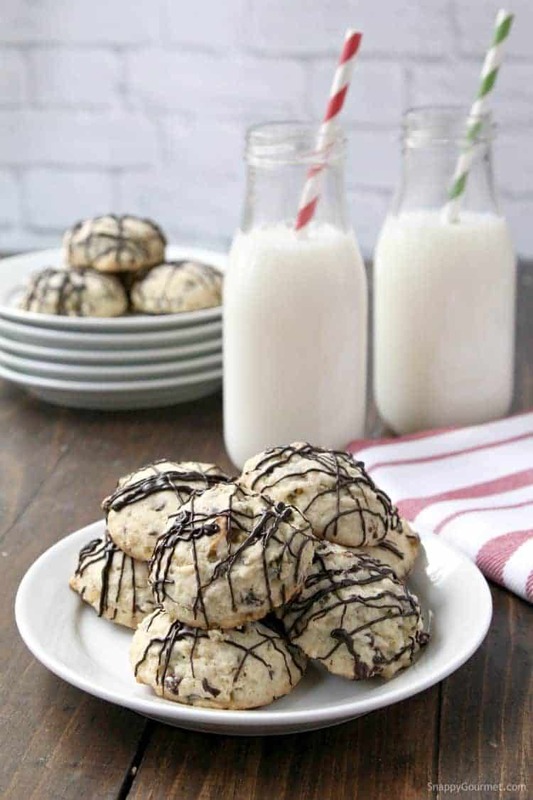 Check out some of my other popular cookie recipes including my Mudslide Cookies, S’mores Bars, Buckeye Thumbprints, and Strawberry Daiquiri Cookies! Holy Cannoli Cookies, easy Italian Christmas cookies and fun twist on the Italian pastry! 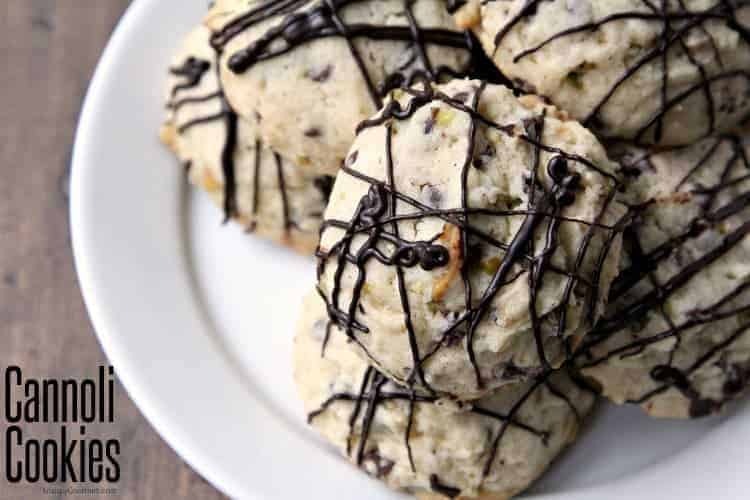 These one bowl cookies are full of flavor with ricotta cheese, chocolate chips, and pistachios and have a soft almost cake like texture! In a large mixing bowl cream the butter and sugar together with an electric mixer until light and fluffy. Mix in the eggs then ricotta cheese until well combined then mix in the vanilla extract, cinnamon, and fresh orange zest. Next, mix in the baking powder, baking soda, and salt until well combined. Mix in the flour. Stir in 1 cup of chocolate chips and the pistachios. Cover and refrigerate the dough for at least one hour. Preheat oven to 375 degrees F. Line baking sheets with parchment paper or lightly grease. Using a medium cookie scoop or spoon, drop about 1 1/2 tablespoons of cookie dough for each cookie leaving about 2 inches between each cookie. Bake cookies at 375 degrees F for about 8-11 minutes or until golden brown around the edges. Cool slightly then move to wire racks to cool completely. Microwave remaining chocolate chips on high in a small microwave safe bowl in 20 second intervals, stirring after each interval until melted and smooth. Spoon melted chocolate into a small resealable bag, clip one corner slightly, then drizzle melted chocolate over cookies. Let cool for chocolate to set. SNAPPY SUBSTITUTIONS: Use your favorite baking chips and nuts instead of the mini chocolate chips and pistachios if you'd like. MAKING SUBSTITUTIONS OR CHANGES TO THE RECIPE AND/OR INGREDIENTS CAN CHANGE THE RESULTS OF THE COOKIE. Looking for other Italian dessert recipes? How about this Tiramisu from Electric Blue Food? Love that it’s made in little glasses! Or this Chocolate Panna Cotta from Inside the Rustic Kitchen looks heavenly! These Almond Biscotti from Munaty Cooking look so easy to make! Just made them. Delicious! They have replaced my ricotta cookie recipe. I have no luck melting chips, so I ended up making frosting. For new bakers, I suggest to buy an oven thermometer and only put cookies and cakes in oven, when correct temperature is reached. We can’t have nuts but one cup of chips was plenty. So happy to have found your site. So happy to hear you enjoyed the cookies! Melting chocolate chips can be tough depending on the brand. Chocolate bars tend to melt better if you want to give that a try instead. Oh doing the recipe in a 13x9x2 pan came out beautifully. Cut them into little squares and everyone loved the little cakes. Sprinkled the top with mini chocolate chips while it was still hot. How long did you bake this for? Hello! I am wanting to try the cannoli recipe as a cookie and bars. Checking to see how long you cooked in the 13x9x2 pan and at what temp? Thank you! What temperature and how long did you bake them for? Just made these substituting GF all purpose flour ~ they came out awesome! Will definately make these again. OMG 12 dozen?? You are amazing! Glad you like them! Well it’s not 100% necessary but the cookies may flatten a bit and you may be a bit disappointed but don’t think a bunch of kids would notice. I would suggest if you have time, bake one (while you put the rest of the dough in the fridge), and see if you like it. You could also flatten out the dough in a large sheet pan (rather than a deep bowl) and refrigerate or freeze for a little while. A shallow pan would help expedite chilling the dough. Best of luck to your daughter! Thank you! We actually wound up having enough time to refrigerate for about 45 minutes. They came out wonderfully! The kids loved them, and the teachers went crazy over them! I made these yesterday for a party and everyone loved them, they vanished in no time! They are so tasty and easy! I love the hint of orange from the orange zest, it’s subtle not overpowering. My mini chips melted easily in the microwave. I put them in for 30 seconds, stirred, and then put them in twice more for 20 seconds each. Once on the cookie the chocolate wasn’t hardening fast enough for transport so I just stuck the whole batch in the fridge for 15-20 minutes and that solved the problem, they survived the trip fine. I am making them again this weekend for another party on Saturday and am doubling the recipe. I’m not a fan of cannoli and I pretty much despise anything orange flavored (although I do like oranges themselves). LOVE the cookies and I even added a 1/4 tsp of orange extract to punch up the orange. This is the 3rd time I’ve made these and the melted chocolate was not adhering to the cookie so I might try the powdered sugar. Overall awesome cookie! Happy to hear you love the cookies! Powdered sugar is a great alternative! Sorry the chocolate didn’t work out. Some chocolate seems to melt better than others so can cause some issues. Happy holidays! I am making them tomorrow 12-15-18……will they last until Christmas? Should I freeze them? I am making them for a cookie exchange but would like to have some for Christmas Day Desert. I would definitely freeze them if it’s going to be more than a few days. I made them today and they turned out great…..packed them in zip lock bags with wax paper to separate the layers…then sucked out all the air and storing them in the fridge… inside cookie tins… I really feel they will be fine. Glad they worked out well for you! Happy holidays! Thank You for getting back to me. As they are on the cakey side, I am going to give it a try. 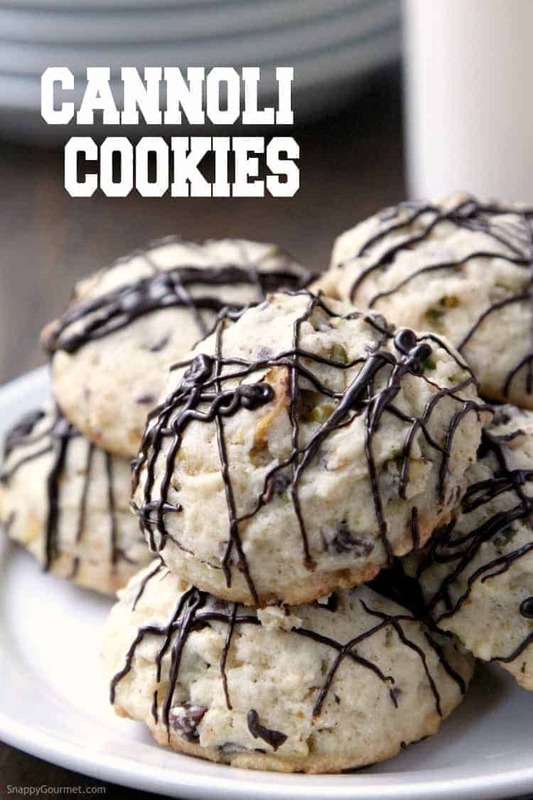 I’m dying to try these, however, I like to make my cookies 2 weeks in advance, and usually freeze them. How far in advance can you make these and how should they be stored. I would also like to try to dip 1/2 of the cookie in chocolate. I love making cannoli’s, but it is a lot of work. Thank you for the recipe. They sound delicious. They definitely can be frozen. Will they be as good? Guess it’s personal preference, but they should be fine. Thanks for posting this recipe! I stumbled upon it while searching for a cookie recipe to make for the office cookie exchange. These came out very nice and were a hit! In terms of the ingredients and amounts, I followed the recipe exactly. However, these took a bit longer then 8-11 minutes to cook, more along the lines of 15-18 minutes for me. I will definitely make these again! Thanks Robert! Glad you enjoyed the cookies! Can these be made into a 13x9x2 inch pan. You probably could although I haven’t tried it so can’t really say what the results would be like. The cookies are a bit on the cakey side. These are delicious! Thank you for posting this recipe. I am not sure why the rest of my mini morsels didn’t melt in the microwave, but I had some left over dark chocolate morsels that melted just fine. And the trick with the plastic sandwich bag for drizzling chocolate on top worked like a charm. I found that shaking it back and forth did a fine job of distributing the chocolate evenly.